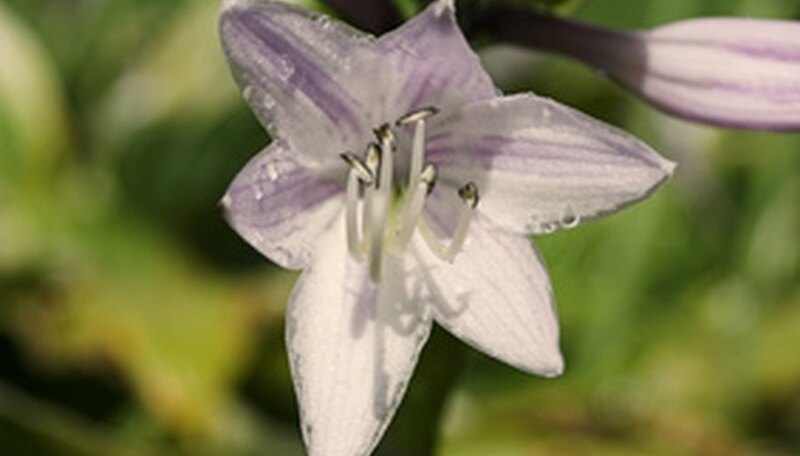 Although the main decorative purpose of hostas is the color and texture of the plant's large tapering leaves, they also produce long clusters of bell-shaped flowers on long spiking stems. Flower colors vary somewhat from white to blue to purple depending on the variety. Some gardeners prefer to leave the flowers to grow, while others deadhead the blooms, removing them so energy that would have been spent on the flowers going to seed, goes instead to building healthier leaves and roots. Trimming off the flowers can be done at any time, depending on the preference of the gardener, but is usually done after all the blooms have opened and have begun to die off. Grasp the long spiking stem of one of the flower clusters of the hosta and follow the stalk down with a hand until you have reached the base of the stem. Gently move apart and push back any leaves that are close to the base of the stem to avoid accidentally cutting them. This can be done by simply laying them over and smoothing them out gently with your hand, being careful not to tear or break any leaves. Cut the stem with sharp scissors as close to base of the stem as you can without damaging any of the surrounding leaves. Repeat the process on the remaining flowers being careful not to crush or cut any of the leaves and gently fluff up the foliage when all of the flower stems have been cut out. Fertilizing hostas, although not necessary, can help to produce more leaves, deeper color and bigger blooms. To fertilize use compost at the beginning of each season or add a balanced commercial fertilizer with values that range approximately 10-10-10 according to package directions. Stop fertilizing by the end of July to allow the plant to prepare for its dormancy in the winter.